I thought the IMSI unlock saga is done and dusted but apparently there are more to it. All credit goes to Loktar_Sun from weiphone.com who pursued an earlier lead that many, yours truly included, have gave up as a viable exploit. What do you need: A jailbroken iPhone that can be activated in iTunes (that is, not officially blacklisted), a computer with the latest iTunes installed and working internet connection. You will also need to know the carrier that your iPhone is locked to. 1. Step one: Install Sam Bingner’s SAM (Subscriber Artificial Module) package. I recommend that you get it from repo.bingner.com since older versions have a different interface and may not work for this purpose. 2. Enter SAM by either going through the settings menu or find the SAMPrefs icon on your springboard. You will need to have the SIM card you intend to use in your phone. 4. With SAM enabled, choose “By Country and Carrier” in “Method”; find your carrier, for some carriers operating more than one Carrier ID you may need to select “SIM ID”; easy to tell since iTunes will not activate if the wrong IMSI is selected. 5. Go to More Information”, copy or write down the IMSI in “SAM Details”, then tap “Spoof Real SIM to SAM”. 6. Go back to the main SAM screen and change your “Method” to manual. Paste or enter the IMSI string we saved in Step 5. 7. Connect your iPhone to your computer and allow iTunes to do its job (namely re-activating your phone), double click “Phone Number” parameter at the main device screen and make sure that the ICCID matches that of your SIM card. If not you need to start over from Step 1. 8. Unplug your phone, close iTunes. 9. Disable SAM. The source article says to uninstall SAM and delete your lockdownd folders; it’s unnecessary. 10. Connect your phone to iTunes again, you should get an error saying that your phone cannot be activated. This is normal. Just close iTunes and open it again. 11. You should see signal bars in a short time, congratulations. 12. Push notifications may stop working after this procedure but can be easily restored with “clear push” utility in SAM followed by connecting to iTunes. Your phone will work normally with your SIM card and that SIM card ONLY since we have tricked iTunes to think that ICCID is one of the intended carrier’s. The phone can be rebooted and connected to iTunes freely without losing the “unlock”, at least for now. KB Home / WinZip / Encryption / How do you encrypt files in a Zip file with WinZip? WinZip provides two alternatives for encrypting files. The most efficient way to encrypt files is to do so while you are adding them to a Zip file (.zip or .zipx). If you are creating a Zip file in a folder window using the context menu (right click), you will have an option to encrypt the files if the Add dialog is displayed. If you choose to add files to an existing Zip file using Add to recently used Zip file there will be no Add dialog and therefore no opportunity to encrypt the files while they are being added. In such a case, you can encrypt files after they have been added. In either case, WinZip will ask for a password (and encryption method if you are using the Classic interface) and then encrypt all files currently in the Zip file. If a file in the Zip file is already encrypted, it will first be decrypted and then re-encrypted using the password and encryption method you specified. WinZip will first try to decrypt the file using the current password; if the file cannot be decrypted with this password, WinZip will ask you for the correct password. If you are unable to supply the correct password, the file can be skipped, and it will remain unchanged in the Zip file. The password you entered in the Encrypt dialog box will remain active until either you delete or replace it, or you close the archive. This script embeds all artwork to the music files. Open up cmd and type cscript “path/to/vbs/script”, hit Enter, and choose your playlist (like “Music”). Hope this helps other people like me who love iTunes but can’t be bothered to individually embed. This is particularly useful if you’re using iTunes to manage your library, but using something else to listen to music and want your album art to show up. We see quite a few questions in our Jailbreak Forums about jailbreak basics. So, we’ve decided to compile a master list of some basic jailbreak magic right here in one place. Hopefully this will help a lot of you beginner jailbreakers learn the ropes (and maybe even help some of you decide whether the leap to the jailbreak world has its advantages for you). We’ve included common jailbreak lingo, popular jailbreak apps and tools, and videos highlighting some awesome jailbreak utilities! There are usually several ways to Jailbreak depending exactly when a new version of iOS is released, when a new exploit is found, and when new Jailbreaks are released. Some are one-button easy, others command-line complicated. Here are the latest and the simplest. If you’re not sure, here’s how to find out which iOS software and iPhone modem firmware you’re running. The most obvious of all terms, but yet the most confused. Jailbreaking simply allows users to have access to certain core functionality that Apple doesn’t give us stock. A jailbreak also gives users access to applications Apple may have rejected via Cydia. It also allows custom loading of apps (on Android, loading applications yourself is referred to as side-loading, just as rooting is to Android, jailbreak is to iPhone). On the iPhone you can use the SSH method or use iPhone Explorer. Jailbreaking allows customization at its core meaning, but shouldn’t be confused with unlocking. Unlocking your iPhone allows you to use it on any GSM carrier. Simply meaning, if you have an AT&T iPhone, unlocking it will allow you to use it on T-Mobile USA or even Rogers Wireless in Canada by simply inserting a different SIM card. A lot of jailbreakers will unlock their iPhones not only to use on a different carrier, but to increase resale value. The unlock process can change from firmware to firmware but typically, you’ll need to jailbreak your phone and then install a program via Cydia like ultrasn0w or yellowsn0w, which will then unlock your iPhone. Apple has the App Store, jailbreakers have Cydia in addition to the default App Store. And if you want to be technical, Cydia was THE first App Store. It was available with iOS 1.x and allowed jailbreakers to download apps before the App Store even existed. Those who jailbroke their first generation iPhones on 1.x have seen several jailbreak ideas and concepts become parts of iOS. We would mention Rock here, but seeing as Cydia acquired Rock, there’s probably no point now. Another term you may hear when it comes to Cydia is repos, or repositories. These are simply sources you add in the manage section. ModMyi and BigBoss are two of the largest. They are already added when you install Cydia. You are always welcome to add custom repos if you choose. I highly advise only adding repos from trusted sources. If you have a weird feeling about adding it, I’d probably pass. Many people still confuse these two terms. They ARE different. There IS an easy way to tell which mode your phone is in. If your screen shows a connect to iTunes logo with a slide for emergency option, you are in recovery mode. If the slide for emergency option is not there and you only see the connect to iTunes logo, you are in DFU mode (DFU mode can also present as a blank screen as well). Release the power button when the Apple logo appears, but continue holding down the home button. You should be presented with a Connect to iTunes logo. Plug in your phone and iTunes should yell at you and say you must restore the device before it can be used. A lot of people ask about this one and why Cydia wants to save them. When you upgrade firmware in iTunes, you’ll see at the top when you start a restore “Verifying restore with Apple”. Apple only signs current firmware versions. If you accidentally upgrade and then try to downgrade, your restore will fail. SHSH blobs save you from this headache. It will basically give iTunes a fake hand to shake, which in turn, makes iTunes think your restore has been verified. This can be a life saver if you accidentally upgrade and need to downgrade. TinyUmbrella will save SHSH blobs to the Cydia server as well. I highly recommend saving your blobs for every firmware version in case you ever find yourself in this predicament. We have posted a guide on how to save SHSH blobs via TinyUmbrella. The baseband is essentially the part of your device that controls the antennae. This has everything to do with your service and signal. This is why most unlockers have to be extremely careful when upgrading. If the baseband changes, it can permanently keep them from achieving an unlock. This is the main reason most unlockers tend to favor PwnageTool. It creates a custom firmware bundle for you to upgrade to that doesn’t upgrade the baseband, only the main OS. If you are running on a legitimate carrier and don’t care about unlocking, the baseband it typically less of a concern. Wifi and Bluetooth don’t run on the baseband either, so iPod touch or iPad owners typically don’t have concerns when it comes to new baseband versions. On a desktop you have a desktop, on an iPhone you have a springboard. It’s basically the interface you constantly interact with. Another term you’ll come in contact with is respringing. This is basically the act of restarting the springboard. Some jailbreak apps you install will require you to do this. All changes in the appearance of your phone via Winterboard (explained below) will require a respring as well. It’s nothing more than refreshing your desktop on a computer. A lot of people jailbreak for the ability to change the look of their iPhone. Enter Winterboard, which is a free download via Cydia. It’s a necessary utility to install themes and most customizations. Many veteran jailbreakers will remember the days of Summerboard as well. Winterboard took its place a few years back and improved upon several things. When you install a theme, all the components will show up in Winterboard. Depending upon how a theme developer decided to bundle their theme, you may have only one package in Winterboard, or you may have several. I personally prefer when developers separate theme elements. Since Winterboard works as a hierarchy, I can select a theme and if I don’t like the sounds, I can download a sound pack I “do” like and apply that in Winterboard. The key is to move it above the main theme so it overrides the sounds I don’t want. I highly suggest jailbreakers to become very familiar and comfortable with Winterboard. If you do, there is no limit to what you can do to your phone and you’ll be able to tweak and customize even the littlest details of your springboard. This free utility allows you to add quick toggles that will drop down onto your springboard. There are also several plug-ins and themes you can download for SBSettings as well. It’ll also allow you to hide icons you don’t want or use. This is especially useful for hiding stock apps you can’t uninstall. I hide the default weather and stock apps among others that are simply wasting space on my springboard. You’ll also be able to more closely keep tabs on your memory and running processes. This was extremely useful before multitasking. It’s still useful today for freeing up memory and seeing what may be eating through battery or slowing your phone down. Prior to 3.x, iOS didn’t cache icons in a way that created issues. The problem now with 3.x and beyond is the way the file system caches icons. When you switch themes, sometimes you’ll notice certain icons don’t change or they stay stuck on the last theme you had active. Prior to iWipecache, you had to SSH into your phone and delete the cache in certain folders and respring. iWipecache simplifies this process and does it for you on the go. It’s a free utility and something I’d highly recommend to anyone who likes to change UI elements and themes frequently. If there is ever a time iWipeCache doesn’t work, especially under iOS 4.x, try going into Winterboard and toggling Summerboard mode on and off, then respringing. This seems force even the most stubborn icons to change. Open SSH is a utility that allows SSH access to your device. You can then use an SSH client to access your device’s main file system for editing. Simpler utilities now exist, such as iPhone explorer which you’ll download to your PC or Mac. When you plug your iPhone, iPod, or iPad in, it will bring up the file system and you can edit without SSH access. I recommend using a utility like iPhone explorer over SSH as it’s safer. SSH can open you up to hackers and give others access to your file system if you forget to disable it. SSH is also a huge battery hog. The only benefit is that you don’t have to have your phone plugged in to SSH. You must be plugged in to use a utility like iPhone explorer. If you decide to use the SSH option, make sure to change your iPhone root and user passwords. You can visit our Jailbreak Forums if you need help doing this. There are more than a few choices when it comes to selecting a notification app. LockInfo, Intelliscreen, and Notified Pro are all acceptable selections. Most offer trials so it’s really up to personal preference. I’m a major fan of LockInfo and find it much more user friendly than Intelliscreen. Notified Pro has also been gaining some ground and continues to add many improvements as well. Since Apple has yet to improve upon their notification system, I highly suggest checking these out and implementing one of them. You’ll be happy you did. I’ve already posted a guide to setting up LockInfo so be sure to check that out as well. There are many apps that improve SMS capabilities as well. I personally use BiteSMS but apps such as TLert and iRealSMS are more than acceptable candidates as well. QuickReply for SMS is also a good app but be warned that the developer has decided to not continue with it. It’s rumored to go free (if it hasn’t already). So if you’re okay with the current bugs and don’t expect updates, it may be an acceptable option for you. Most of these apps allow you to reply quickly to texts without it interrupting your work-flow. They’ll also allow you to create gestures on the springboard which will allow you to quickly send an SMS without ever leaving the current app you’re already in. Many users are left bitter when certain carriers want to charge them an additional fee just for the privilege of tethering. MyWi is a wonderful little app and in my opinion, a major reason to jailbreak on its own. MyWi alllows you to create a wifi hotspot with your iPhone. I have a wifi only iPad and I never even considered purchasing the 3G version. I simply tether my iPad to my iPhone. Just be wary of doing this if you don’t have an unlimited data plan. As of writing this, MyWi currently costs $19.99. It may seem like a hefty price tag but you’ll pay that in data and/or tethering fees in less than 2 months. You’ll only pay for MyWi once. You do the math. Similar to MyWi, this app is a tweak that allows you to lift certain restrictions carriers and Apple have in place. It will allow you to trick your phone into thinking you have a wifi connection when you are really on the carrier network. This trick comes in handy if you need to download an app over 20MB and aren’t in range of wifi. It also allows you to use FaceTime over 3G as well. There is also another app called 3G Unrestrictor which will also allow you to make FaceTime calls over 3G. As always, if you guys think of anything awesome you think should be on this list, shoot me an e-mail to ally.kazmucha@tipb.com or post it in the comments below! The iPad 2 offers a number of exciting new features. Chief among them is the ability to capture video from the integrated cameras and edit them with the new iMovie for iOS 1.2. Unfortunately, the video camera on the iPad is better suited for FaceTime video calls than for capturing a child’s first steps, or similarly important moments, for posterity. Thankfully, you can import video files captured from other devices, though compatibility is hit or miss. 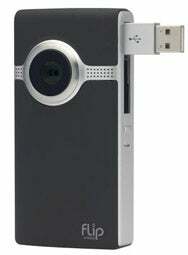 We haven’t had any luck importing files captured from Canon DSLRs, but we have had some success with Cisco’s Flip video cameras. If you have a Flip, here’s how it works. Use your Flip to shoot some video. Pop out the Flip’s built-in USB connector and connect it to the iPad 2 using the Apple Camera Connection Kit’s USB adapter. Note: On the Flash Ultra HD Flip camcorder I used, I had to plug in a powered USB hub between the Flip and the Camera Connection Kit. The Flip Mino HD did not require a hub. Once the Flip is connected to the iPad, the Photos application will launch. A Camera tab will open and thumbnails of your Flip’s clips will load in the window. If you’d like to import all of the clips, immediately hit the blue Import button at the bottom of the screen. To select individual clips to import, simply tap the thumbnail image and a blue checkmark will appear on the thumbnail. After you’ve selected your clips, then tap the blue Import button at the bottom of the screen. The app will ask if you want to import all or just the selected clips. Make your choice, and the app will begin importing your images. When the iPad is done importing, Photos will ask if you’d like to delete the files from the camera. Speaking from prior experience, I recommend choosing Keep Files, and make sure that the movies or photos transferred successfully before deleting anything from the camera. Tap the iMovie icon on your iPad. When the iMovie app opens, Tap the + (plus) icon at the bottom of the screen to start a new project. The video clip, as well as anything you’ve captured to the iPad or imported via syncing, will show up in the upper left hand side of the screen in a window called Video. Tap on the clip and a blue arrow appears, along with a yellow handle at each end of the clip. You can tap and drag the handles to select the section of the clip you want to bring onto your timeline and click the blue arrow to bring it into your project to edit. That’s it! 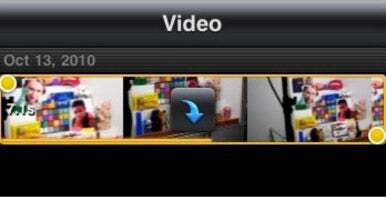 Have you had either luck or problems getting your video clips into iMovie for iOS? Post your suggestions or questions in this story’s comment section.